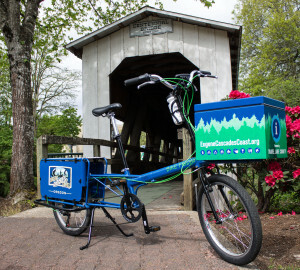 Mike the Bike on his first outing: touring the covered bridges of Cottage Grove! Hey guys, I’m MIKE the Bike. 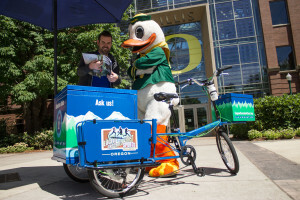 A few months ago I joined the Travel Lane County team as their Mobile Information Kiosk Explorer (get it, M.I.K.E.?) In short, it is my job to conveniently provide you with travel information while you are out exploring all the Eugene, Cascades, and Coast areas have to offer. 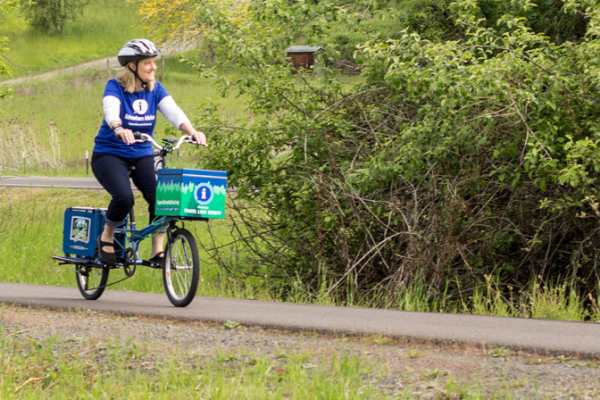 Never seen a bike that doubles as a visitor center? Well I’m a rare breed. Mike the Bike with his parents, Bike Friday. If you visit me while I&apos;m out on the town I can get you maps and brochures, or answer any questions you have about Lane County. And not to toot my own horn too much (or should I say bell) but I also embrace the Oregonian lifestyle by being environmentally friendly. That’s right, no gasoline needed to pump these pedals. One of my favorite things about summer is visiting local events. I love the wide open road under my tires and the wind in my spokes as I cruise around in the sunshine. 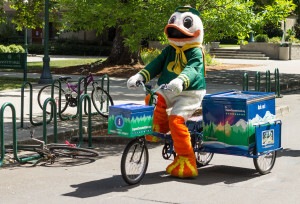 On one of my recent quests I had the opportunity to meet The Duck (from University of Oregon). 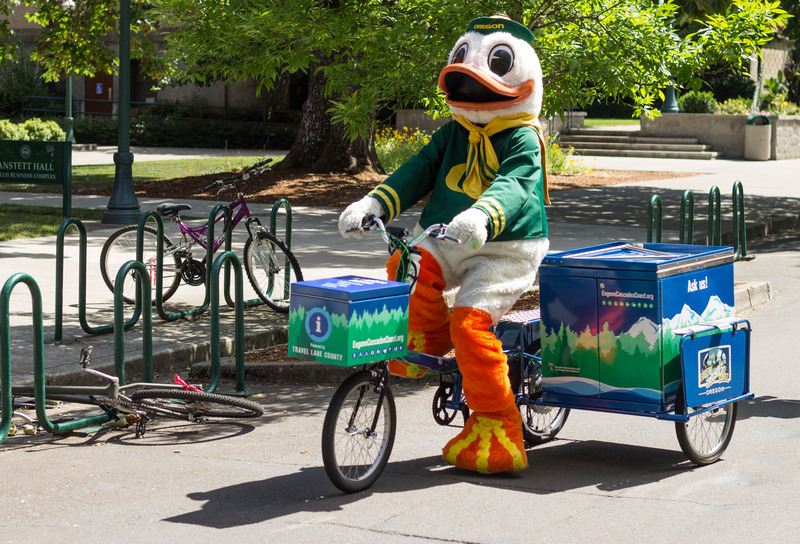 The Duck takes a spin on Mike the Bike. Although I was a little star-struck at first I’d say we hit it off pretty well. On top of that, a few weeks ago I got to visit 16 Tons Cafe to launch Travel Lane County’s first anniversary of the Eugene Ale Trail. What speaks better to an adventurer’s heart than a cold brew and a challenge to visit local breweries? I’m in. Where are you headed this summer? Be on the lookout, because I&apos;m traveling through the Eugene, Cascades and Coast region. The next event I’ll be cruising through is the McKenzie River Lavender Festival. Come say hi and enjoy a day filled with exquisite scents and the magnificence of local lavender farms. I’ll even help steer you towards your next adventure! 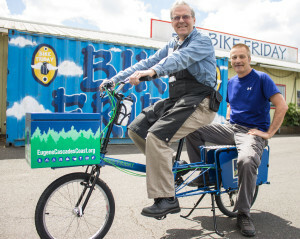 Find more information about MIKE the Bike on his listing. Katie McGuigan has lived her whole life across the Pacific Northwest. With a prepacked box of camping supplies sitting next to her front door, Katie is always ready for weekend adventures. When she is not on the trail she spends most of her free time enjoying Lane County's local craft breweries or cooking up the freshest veggies from her garden. She is a past Tourism Coordinator for Travel Lane County. $10 Off Your Food Purchase of $45 or More!